A rosary beads necklace with the cross is a symbol of the divinity and association of Jesus Christ with Christianity. Feel the existence of almighty around you by chanting his name through prayers. 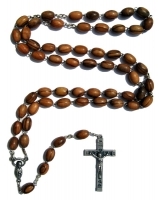 At HolyLand-Gifts.com, we leave no stone unturned to make you happy and satisfied with a fine collection of exquisite and unique rosary beads that are made by Bethlehem Christian artists who give birth to fine quality religious items. With us, you can easily have mother of pearl rosary or olive wood rosary bead necklaces in various colors, styles and patterns. At our website, you can easily get answer to your queries as there you get fine quality and impeccable gifts in different styles, finishes, designs and sizes suiting your specific religious needs so that you can use them as gifts on specific occasions. With our wide and exhaustive variety of unique gifts, you can add more color and love to the existence and relevance of Jesus Christ for Christianity. I have shopped at the rosary beads necklace supply store and liked it. I seriously think it is a cool store.